Let me thank you for the congratulation and thank you cordially for your specific contribution to the process of lobbying for improving the image of Albania as a democratic state, model for Peace and Prosperity for Balkans and all countries aspiring for Peace and Civilization. 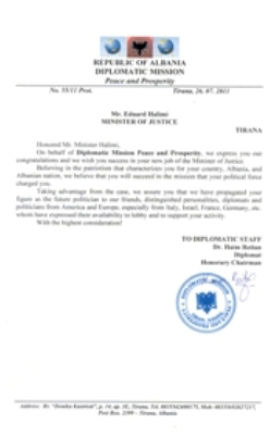 I also ensure you of the extraordinary will of the Ministry of Justice to further cooperate with the Diplomatic Mission Peace and Prosperity and simultaneously express our readiness to welcome any initiative to the effect of strengthening the cooperation in meeting the aspirations of the integration of Albania into the European Union. On behalf of Diplomatic Mission Peace and Prosperity, we express you our congratulations and we wish you success in your new job of the Minister of Justice. Believing in the patriotism that characterizes you for your country, Albania, and Albanian nation, we believe that you will succeed in the mission that your political force charged you. Taking advantage from the case, we assure you that we have propagated your figure as the future politician to our friends, distinguished personalities, diplomats and politicians from America and Europe, especially from Italy, Israel, France, Germany, etc. whom have expressed their availability to lobby and to support your activity.